This guide is written to help you deploy the FileChimp Outlook Addin settings to multiple computers on your network. Once you have set each computer to receive the network configuration any changes made to the master configuration will update each of the clients who are set to use the network configurations. Access ADMIN mode by clicking on the lock symbol (if you don't know how to unlock the padlock please contact us). Adjust the settings as you require making sure to lock any settings you do not want the users to be able to alter. Once you are ready to save your central configuration click the save to disk icon. You can now proceed to any other users computer. At a second computer access the ADMIN mode once again. Click the folder icon to browse for a central configuration file. Exit admin mode by clicking the padlock again, or by clicking OK.
You can make future changes from any computer, simply open the settings in ADMIN mode, make the changes and re-save to the same central configuration file. Any computers referencing this central configuration will be updated. To prevent a computer from receiving the central configuration access the ADMIN mode and click the red cross to clear the central configuration and revert to using a local configuration file. Remember that if you are deploying your configuration to multiple users and you have specified paths within the users profile the paths should be specified using the %username% variable. 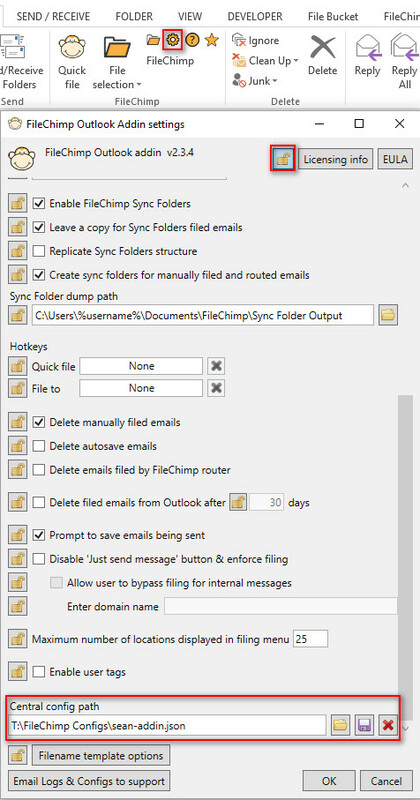 Now that you have configured central FileChimp addin settings take a look at deploying the taskbar Application settings, profile and rules. Read more here. If you are a network administrator and would like to deploy common settings by copying the configuration files by script or command line please read more here.